This post contains affiliate links marked with an asterisk. 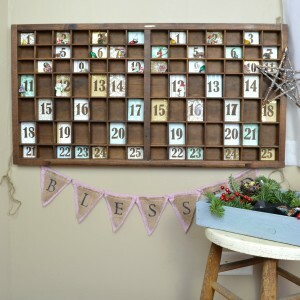 My DIY gift started with a thrift store (or was it an estate sale? I honestly can’t remember…) find – these glass cups that I assume were part of punch bowl sets. Or perhaps someone actually knows what they were used for. In any case, now they are candles, so I suppose that’s all that matters. I used my Silhouette to make a vinyl stencil with holiday words. Because the cups are smaller at the bottom than they are at the top, I found I needed to fold the stencil slightly in the corners. 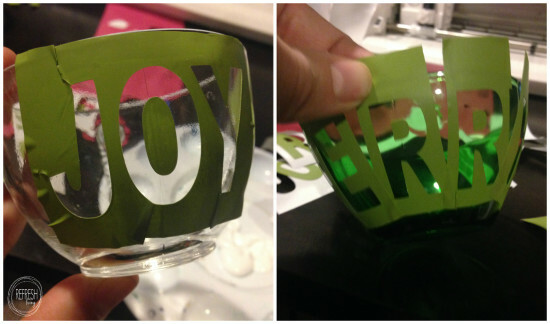 For the green cups, I ended up needing to cut out individual letters because the slant of the cup was too steep for it to lay flat. They ended up working just as well. After making sure the edges were stuck down well, I painted them with enamel glass paint. 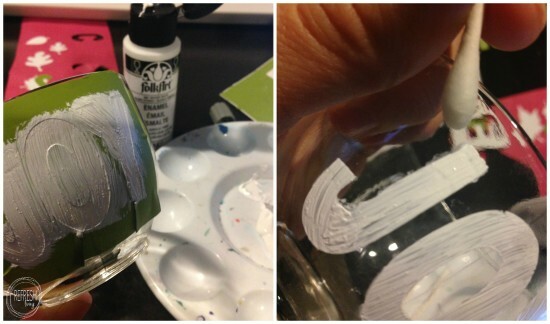 I’ve used glass paint with Silhouette stencils once before on these candy corn leaf jars, and I learned to take the stencil off right after you have finished painting. Don’t be discouraged if you get a little bleed through – it wipes off with a little water. I found that Q-tips (one side wet, the other dry) work great for fixing those marks. Now, if you don’t have a cutting machine, stickers also work for painting on the letters. I tried it out, and they turned out perfect! 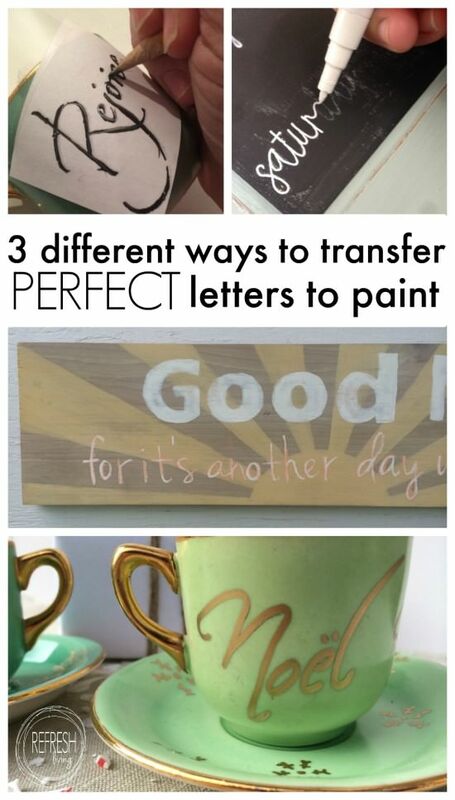 You could also hand letter the words with a paint pen. I did that when I made teacup candles last year. I give all my tips for how to hand letter like a pro in this post! 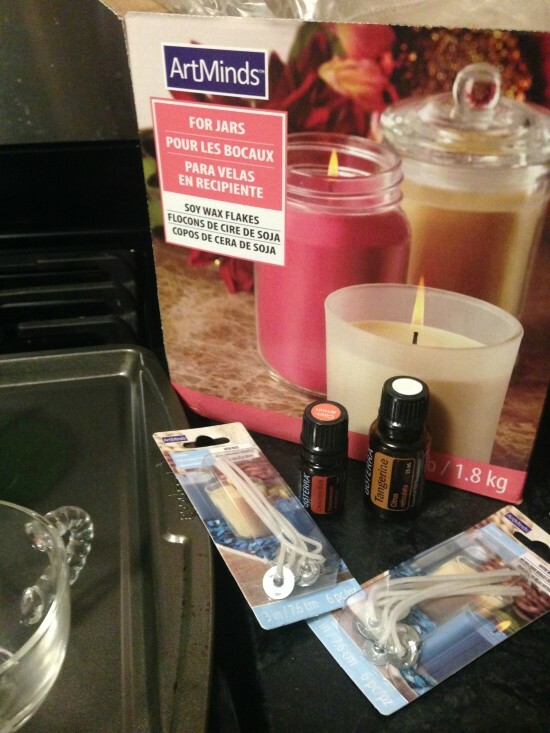 I followed the directions on the back of the paint to cure it in the oven (it ends up taking about an hour) and then I was ready to start the candle-making process. I learned last time I made candles that the wicks like to float away as the wax melts, so I figured out I needed small candle wicks* with the little metal discs on the bottom, as well as something called wax adhesive *. After putting the wicks in place, I added soy wax *. You could use paraffin wax or beeswax *, too. Just to give you a reference – I used about 1 pound of soy wax for these 5 candles, so it gets used up quicker than you’d think. 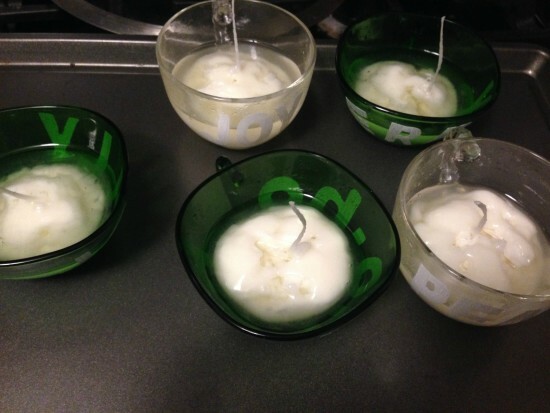 After filling up the cups, I put them in a 250 degree oven and let the wax melt down. 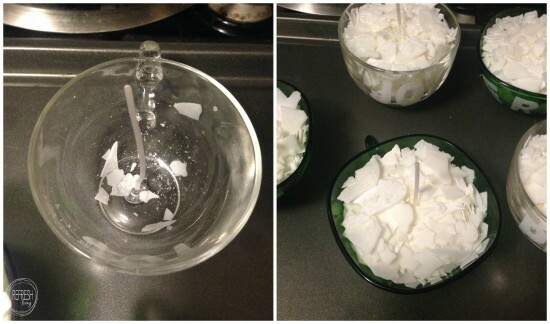 After about 15 minutes, the melted wax only fills up half of the cup. I added my cinnamon and tangerine essential oils at this point and then filled up the rest of the cup with more wax. After another 15 minutes or so in the oven, they are ready to be removed and can sit out to cool. After letting the wax harden, they are ready to be wrapped up as unique handmade gifts. I added a little tag so my daughter can give these as little gifts to her teachers. Now, let’s get to the fun stuff – a chance to win some money!! Good luck! 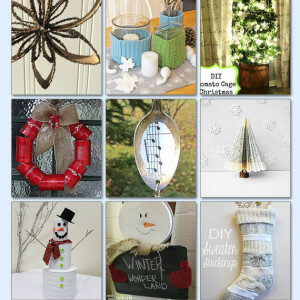 Be sure to gain some handmade holiday gift idea inspiration from the other amazing ideas below! 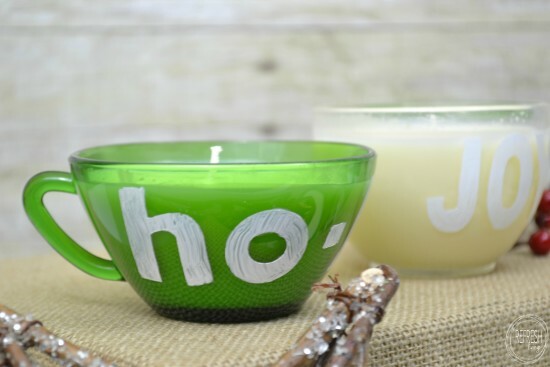 Very festive and just the right size for gift giving! Thanks for the tutorial and inspiration! 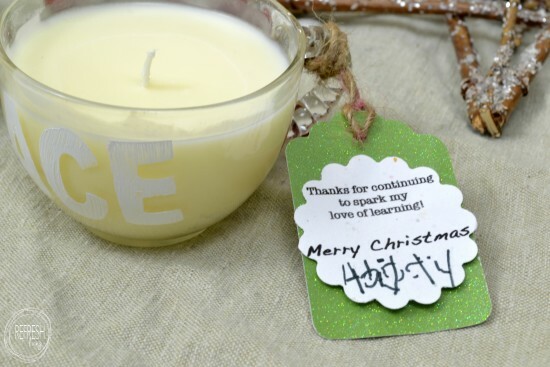 Thanks, Pam – you’re right – they are perfect for a little gift to someone! Thanks so much, Bre! 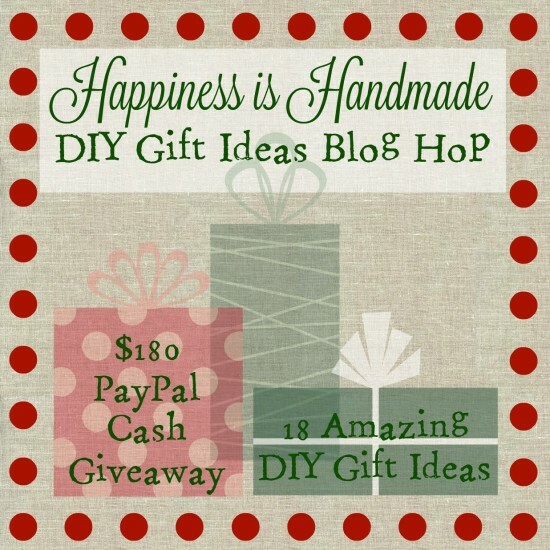 This was such a fun blog hop! 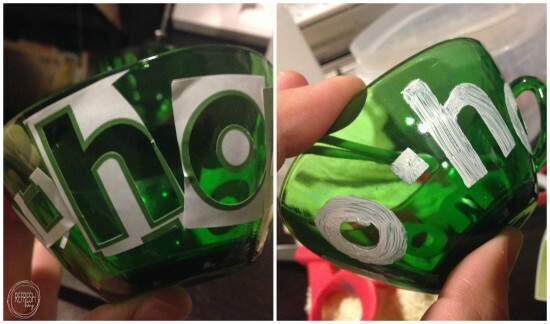 I just love how you repurposed those cups! I’m all about that. And, I love candles. Thanks for sharing! Such a great gift idea. Thanks, Sara! I just loved the shape of them and knew I needed to do something cute with them. 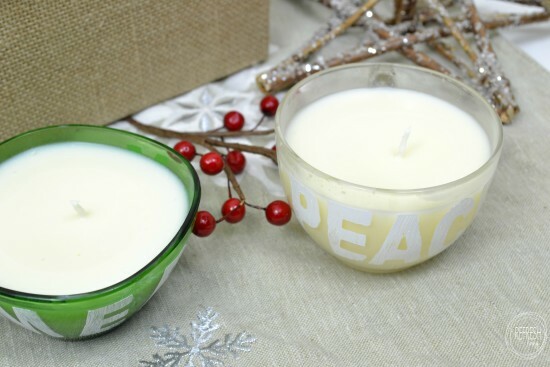 These Christmas candles turned out so so nice Jenny! I like that you used something you had at home – the glass cups, which btw. already looked really cute before. 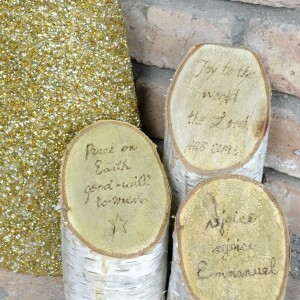 Then, adding some personality and the candles made them really stand out! 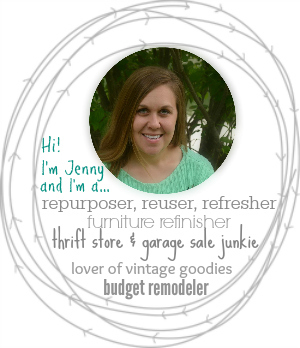 What a great way to bring new life to those cute little cups, Jenny. I just love working with enamel paint on glass too. 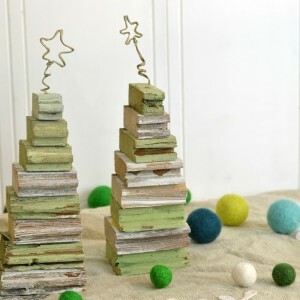 This is such a festive gift idea! 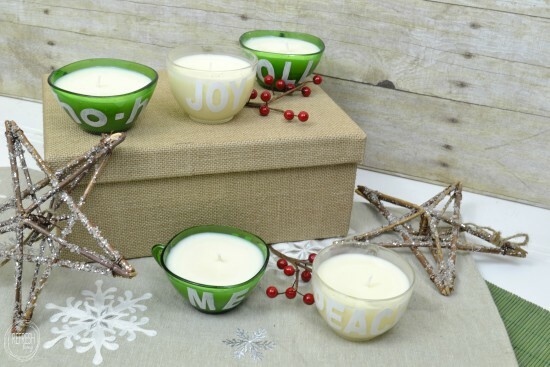 I really love this idea to make candles out of old cups. They turned out really cute, Jenny! 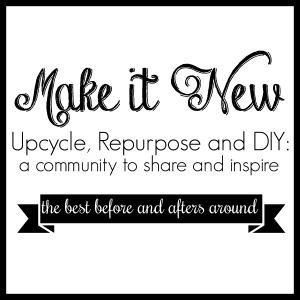 (Just started reading your blog so I am catching up on some old posts!). Great tutorial! This is a project that has been on my list for awhile, I just haven’t been able to find the perfect cups yet. Yours are super cute! 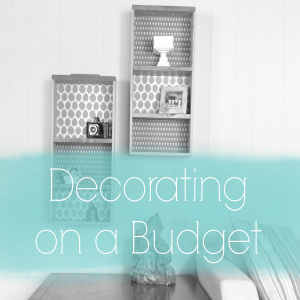 And you had some good tips that I hadn’t heard before for this particular project. Thanks!